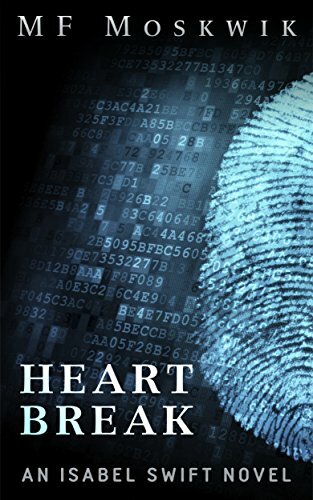 “Heart Break” by MF Moskwik is the first novel in the Isabel Swift series. Isabel Swift is a young police officer with ambitions to become a detective. When her mentor passes away unexpectedly, she has to team up with British forensic data scientist, Mark Jameson. The two are brought together to find solve the disappearance of some top-secret technology. Initially Isabel is given very little information about what the technology does, but when other officers start dying, she sees a connection. This becomes evident when it is discovered the deaths were all caused by failed medical devices that are on their bodies. Another clue in the case is that all of the officers graduated from the police academy twenty-five years ago. Isabel has to work hard to solve this case quickly because the remaining officers will be getting together for their 25th reunion in two days. Isabel suspects there will be more murders if she doesn’t find out who is behind these deaths. She also has to deal with Jameson, who seems to be more interested in sitting behind a computer analyzing data than being out in the field. Events get really exciting and dangerous for both of them when the person behind the deaths becomes aware of their involvement in trying to find him and stop him from his planned grand finale. I really enjoyed reading “Heart Break” by MF Moskwik. The character development was well done and the use of new technology to kill others made the premise unique. The banter between the two main characters was also enjoyable. Other supporting characters add to the intrigue and help round out the story so that it is more complex. I look forward to following this series and finding out what new adventures Isabel Swift has waiting for her.